But Israel seems to be alone this time. Both the United States and other Western nations appeared to warmly welcome the new Iranian president at the UN. 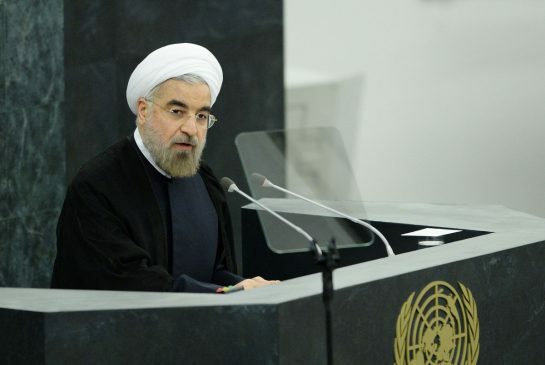 The President also suggested that the world should recognise Iran’s basic right to carry out all parts of its nuclear fuel cycle. In short, Iran is going ahead with its nuclear project. And this is indeed very good news. So what changed really? Only one thing, I guess. The nations seem to have changed their appetite. And they are somehow brave enough to admit it to themselves. Due to some intense Jewish lobbying and the submissive nature of contemporary Western politicians, not many Western governments dare criticise Israel. They clearly fear Netanyahu and his network of ‘800 pound gorillas’. By means of kindness towards Israel’s ‘enemy’, our weak politicians have managed to find a way to deliver a message to Israel. Welcoming Rouhani at the UN was a clear message to the Jewish State and its supportive lobby: beware, we are gradually becoming tired of your dirty politics and pushing for wars. Being an avid reader of Jewish history, I allow myself to say that the failure to read the writing on the wall is intrinsic to Jewish identity politics and culture. One might expect Israel and the Lobby to back off at this point. But this is not going to happen. Israel and the Lobby will act more obnoxiously. They will use every trick in their book to close this opening window of a dialogue and reconciliation. Israel is doomed to bring a tragedy on itself and the region. Even God won’t be able to save his chosen people from themselves. But there is something the UN can do: stripping Israel of its chemical, biological and nuclear arsenal. I can see such a demand brewing up and I would love to see it materialising soon.